Shock new figures show the average waiting times for those accessing child and adolescent support in NHS Grampian are the worst in Scotland at 21 weeks – double the national average of 11. 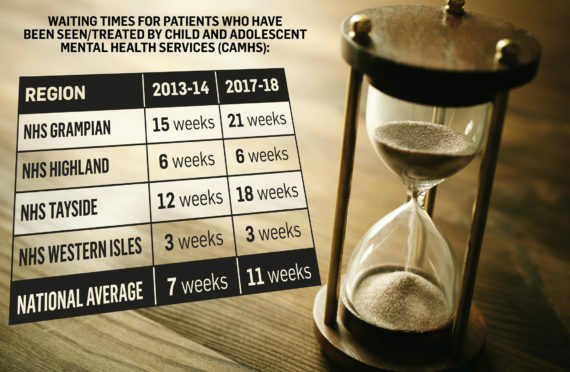 The data shows the wait for child and adolescent mental health services (CAMHS) has been getting longer and longer over the last five years, increased from 15 weeks in 2013/14. NHS Scotland’s target waiting time for young people to get access to mental health services is 18 weeks, which all health boards bar Grampian has achieved. In the Western Isles, patients only had to wait three weeks on average, while NHS Highland had a six weeks waiting list. The figures were obtained by the Conservatives through a parliamentary question. Last night, Highlands and Islands MSP Halcro Johnston urged NHS Grampian to address the problem quickly. He said: “It is disturbing to see that children and young people having to wait an average of over five months to access mental health treatment here in Moray. When government at all levels is supposed to be pulling together to make mental health a priority, key measures of performance are getting worse. “NHS Grampian is, by some measure, the poorest performing NHS Board in Scotland for these waiting times. A spokeswoman for the health board said the waiting time was “slowly improving” but stressed the wait was down to limited “capacity”. But Penumbra, one of Scotland’s largest mental health charities, insisted action must be taken now to secure early help for young people. With almost half of mental health problems experienced in later life being present by the age of 14, the charity believes there is a clear need to focus more on identifying and preventing mental ill health in children and young people. Chief executive Nigel Henderson said: “The recently published figures for CAMHS waiting times show that the average wait across Scotland is 11 weeks with NHS Grampian reporting the highest figure of 21 weeks on average. “However what these figures don’t show is the absence of early help or support for young people and their families in the community. The Scottish Government has recently committed £5million in funding and set up a taskforce to improve CAMHS in Scotland. A spokeswoman for NHS Grampian said that the health board were striving to improve their service to meet the national target. “Our performance against the 18 weeks target is slowly improving,” she said. “However, it continues to be impacted by available capacity and the need to prioritise and see a higher proportion of long waits.